If you're in any way drawn to the inherent beauty of diamonds, you're well aware that the sparkling gemstone is a jewelry-box staple that won't soon go out of style. Possibly the most charming gift that can be passed down for generations, a simple diamond necklace has stunning quality that is not to be underestimated. Whether it's set in gold or silver, adorned with a simple few or a multitude of stones, a diamond necklace makes for a simple piece of jewelry that every woman needs. If you're looking to build a jewelry collection you'll be proud of in 10 years or in search of a gift that will surely delight, you can't go wrong with any one of these necklaces that have been handpicked for their elevated design. From dainty pieces that are begging to be layered to pendants that deserve to be worn all on their own, there's a necklace design to suit every taste. Choose a design that stands the test of time because, after all, diamonds are a girl's best friend. Go on to shop (or just obsess over) these 21 simple diamond necklaces that have an undeniably timeless design. Tiny and simple to wear every single day. A pearl-and-diamond combination done right. On a delicate chain, this sweet necklace is also the perfect layering piece to pair with dainty chokers. Chokers may be just a jewelry trend, but we love how this piece feels like a classic. 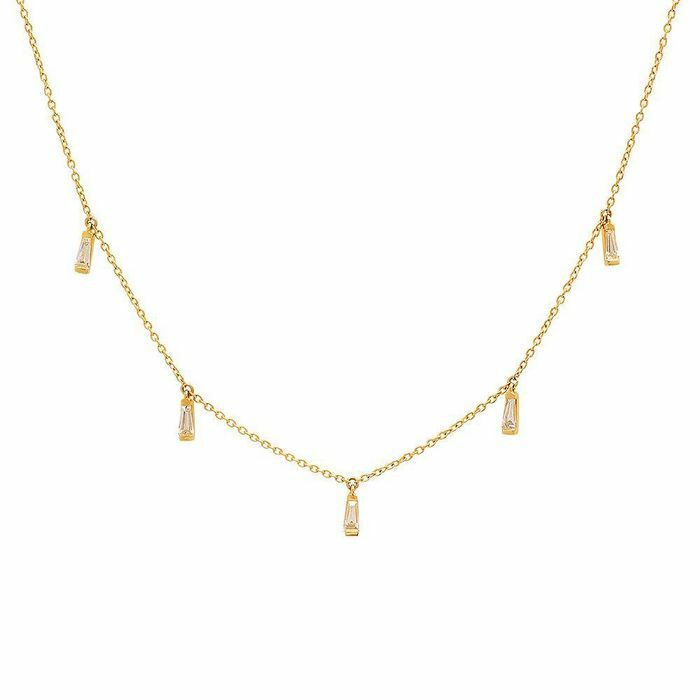 Layer this modern lariat with its coordinating necklace just like designer Jennifer Meyer intended. This geometric piece evokes the beauty of architectural forms. 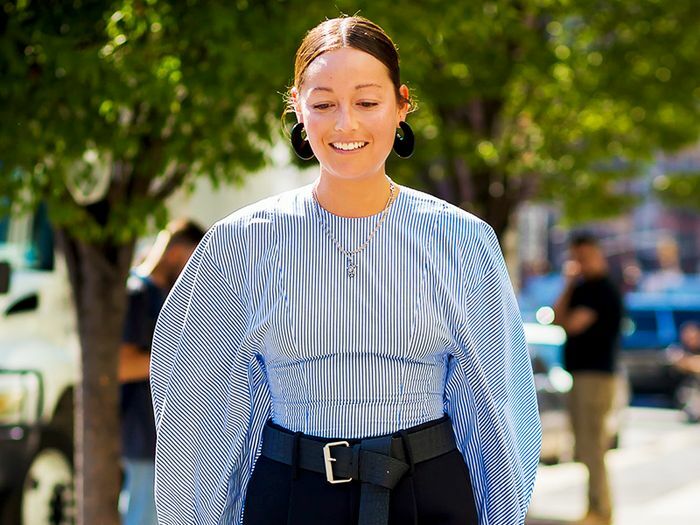 The 18-karat yellow-gold piece adds a subtle weight to understated looks. We love how these five stones look set against the ivory-toned pebble. For the girl committed to silver jewelry. Yellow gold elegantly frames these three circle-cut diamonds. Three tiny evil eye charms make this ideal for a first-time diamond owner. This charming diamond gold plate deserves a closer look. Wear with a sultry plunging neckline for maximum effect. Small stones and cuts are combined with beautiful gold stars to evoke a constellation design. Artfully constructed, this perfectly offbeat circle necklace is encrusted with shimmering diamonds on a silver plating and effortlessly mixes with the gold chain. This delicately crafted T-bar necklace made from 18-karat gold is adorned with sparkling pavé diamonds. This minimal beauty is the definition of pared-down luxury. A delicate openwork circle pendant suspends a single round diamond for subtle, wear-with-everything sparkle. Selim Mouzannar's 18-karat pink-gold Mina necklace, inspired by the ornate architecture of the Ottoman Empire, is the perfect finishing touch to evening ensembles. This article was originally published at an earlier date and has since been updated. Next up, five easy ways to tell if a diamond is real or fake.